Last weekend at the farmer’s markets, I bought a ton of fresh lemons. I was really inspired by all the pretty bright colors of summer and wanted to make something really pretty and bright! Following my previous post on the mango salad, I couldn’t help but make another summer theme dish. I also bought some fresh cod fish fillets and decided on making some crispy fried fish. I‘ve always love fried fish. Not so much of fried chicken, but a good fried fish is always on my list of current cravings. Now, normally I would love the pairing of crispy fish with chips but somehow this time, I decided on the the saffron-butter rice option instead. I feel that the saffron-butter rice just complements the fish so well and a couple squirts of fresh lemon juice to finish just makes the flavors pop! Heat the oil in a large heavy skillet over a medium-high heat. Meanwhile, season the fish with salt and pepper and then coat them in a little all-purpose flour. Now, in a shallow dish break the eggs and lightly season with salt, pepper, and then add in the fresh thyme leaves. Mix that all together. Dip the flour coated fish into the egg mixture and then coat them with the combine flour mixture of all-purpose and the cornstarch. Shake off excess flour and let it rest for 5 minutes. Cook the fish fillet in the hot oil for 4-5 minutes on each side, or until golden brown. Drain on paper towels. Squeeze the juice of a whole lemon over the hot fried fish. Heat the butter and olive oil in a pot over medium heat, then add the rice,saffron, salt and pepper and stir to coat. Then add in the chicken broth and lemon rind. Reduce the heat and cover. Allow it to simmer for about 20 minutes or until all the liquid is absorbed. Fluff it with a fork and then squezee the lemon juice over the warm rice. OMG..this is so so beautiful. Saffron butter rice sounds such a unique idea! I have to try this meal soon! Beautiful, delicious dish for these summer days. I like the use of lemon juice in the rice as well as generously on the fish. I love the saffron butter rice, and the crispy lemon fish – sound like a perfect dinner idea! Gosh, can bright lemons and saffron rice ever go wrong? Salivating! crispy lemon fish sounds like fun to me and on that bed of yellow comforting rice .. perfect meal. That meal looks scrummy! I particularly like the crispy lemon fish. So tempting! o my this looks scrumptious! Love your saffron butter rice! Saffron butter rice has got me excited. May have to make it and change my normal plain old boiled rice. wonderful combination! love the golden hues of the saffron butter rice, and your perfectly crunchy-fried fish with lemon. so tempting! This looks absolutely amazing. I love crispy fish, esp deep fried:) Wish I had this for dinner this evening! I have just had lunch, but this post makes me hungry again!! fresh lemons in the height of summer = good. crispy fried fish = good. lemons and fish = oh heck yes kinda good! Lovely this looks Divine!!!! What a beautiful combination of flavors…. And to top it all the crispy fish… Yummmmmmm…. I need this now. Gorgeous photos! This fish looks so crispy and delicious that even my picky son would love it. Can’t wait to try this recipe AND with the luscious saffron butter rice. P.S. Thanks for visiting ShawnsPlate! I love fried fish too (and also fried chicken hehe) and anything with saffron. This is such a pretty, summertime dish! So vibrant and inviting, I love the Saffron-Butter Rice recipe. I lean towards baking my fish but your batter looks nice nnd light. Mmmmm…..the saffron butter rice seems to be calling out to me!!! That rice looks amazing! I’ve never used saffron before, now I want to try it! oh saffron rice looks fabulous! great recipe- thanks! Ooo, how good does that look. I need to make that fish! What a fantastic way to use cod. 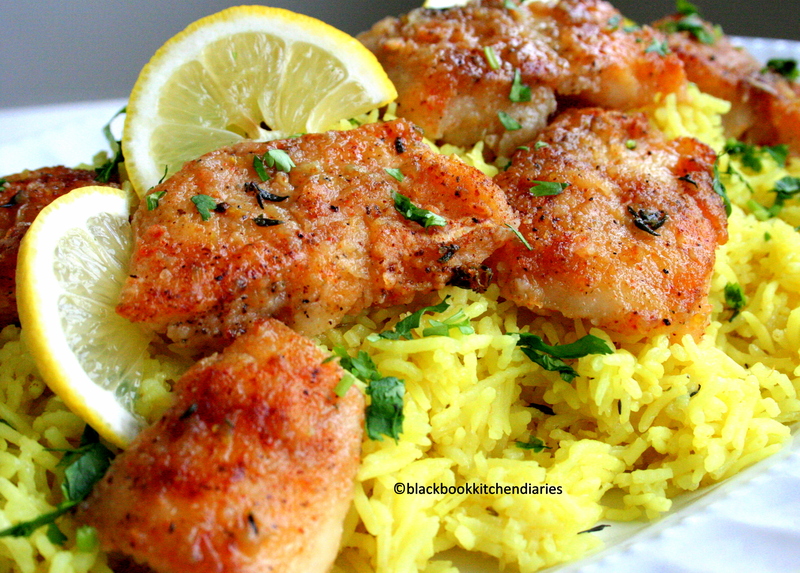 Love the crispy lemon coating (reminds me of a cod ‘francese), and the saffron butter rice looks perfect! A keeper.and I can’t wait to try it! This looks like the perfect meal. Nothing beats a crispy fried fish. Love the lemon flavor too. What a beatiful and frsh dish! Great pick me up 🙂 looks delicious! This looks like a great meal! I am not a fan of fish, but my hubby and son are – and they would LOVE this! This plate clearly screams ‘summer’! That saffron butter rice looks amazing and the perfect accompaniment to that crispy fried fish. I don’t usually think of putting thyme with fish but I can see how it works well with the lemon flavor in here. Gorgeous job, as always, Sarina! You are speaking my language doll! The colors are vibrant, and inviting, and hey, who’s gonna turn down saffron and butta (as the jersey girls would say)? I like that saffron butter rice! I love fried fish – really liking the lemon in your coating and the beautiful saffron butter rice. Yum! Wow this looks beeeautiful! I love the sound of saffron butter rice. I know it’s GOOD! and we love cod too! Whole lemon sounds good to me! I love citrus flavor…. I’ll be bookmarking this and try soon…maybe this week! Those crispy pieces of fish have got me drooling! This dish just shouts “summer” – light and brim full of flavour – not to mention the beautiful colours! I just made saffron rice and it looked NOTHING like this. I am trying again with your recipe. Beautiful meal. Just gorgeous. I’ve normally thrown crisp fried fish in Baja fish tacos- but you’re right, it absolutely holds its own when paired with citrus and saffron. This looks amazing!! I have always wanted to cook with saffron but I never have. This looks so delicious!! Wonderful flavors here! I can imagine how fabulous this tastes, crispy fresh cod with the pop of citrus and delicious saffron butter rice, yum! I like how the citrus in the lemon fish complements the richness of butter rice, and the perfumy aroma of saffron…is amazing. Thanks for this saffron rice recipe! I have been searching for one, it sounds awesome! I need this like now! it looks absolutely delicious! It’s an absolutely beautiful presentation you’ve put together. Wonderful recipe, great photos. All around fantastic! Saffron-Butter Rice… Please count me in 🙂 It looks deliciously good, Sarina. Wonderful dish! I love saffron! I could eat that any time of day. What a beautiful meal. Yum! I’ve never thought of making crispy fish, and I don’t know why… but I’m glad you’ve inspired me! I am such a huge fan of saffron in rice – this looks delicious. I love cod too but haven’t had it in a crispy way before so I can’t wait to try this one! Great recipe. This looks JUST divine! My husband and I love trying new fish recipes! thanks for sharing this one! I love going to the farmers market and getting produce. This sounds delicious! I love the sound of the rice with the fish! Such a delectable combination! This dish looks amazing! Gorgeous color and the flavors are great. That looks so wonderful. I love saffron, it has the most delicious aroma. Great recipe! Lately I have been in the mood for fish, so I have been thinking of serving in different ways. I just love your post and I know for sure I would love it. A terrific meal! Loving the saffron butter rice here! Holy hubcaps, this is gorgeous, love the addition of saffron, and the crispy fish just looks so divine. What a fabulous taste sensation. Wonder if a yogurt dressing would work with this? Mmmmmm…. Yes, I must try this little beauty. I’m always happy with fish, but the saffron-butter rice??? Can I say AMAZING! I hope you are having a restful and happy Sunday. I’m just pulling out a batch of banana bread. Thank you for sharing with me! I can imagine it was delicious! I can never resist crispy fish! Sounds lovely with the saffron rice and fresh lemon. I wish we had lemons at our farmers’ markets! This does look so lemony and bright and flavourful! 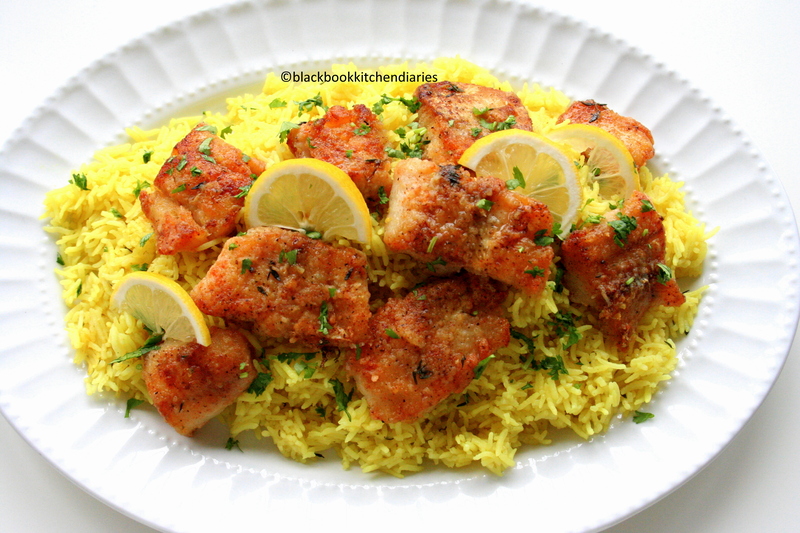 What a perfect combination…love the crispy and lemony fish paired with saffron rice. Beautiful! on August 30, 2011 at 8:59 pm | Reply Julie M.
Look at those gorgeous colors! That is one beautiful dish and a true representation of summer. So, sorry I’ve been MIA! Look what I am missing! This dish looks AMAZING! It’s got the wheels in my mind spinning!!! I love fried fish – actually, I love everything about this dish!! I am not a big fish fan but this looks tasty. Perhaps I will give it a try. Such a stunning dish! 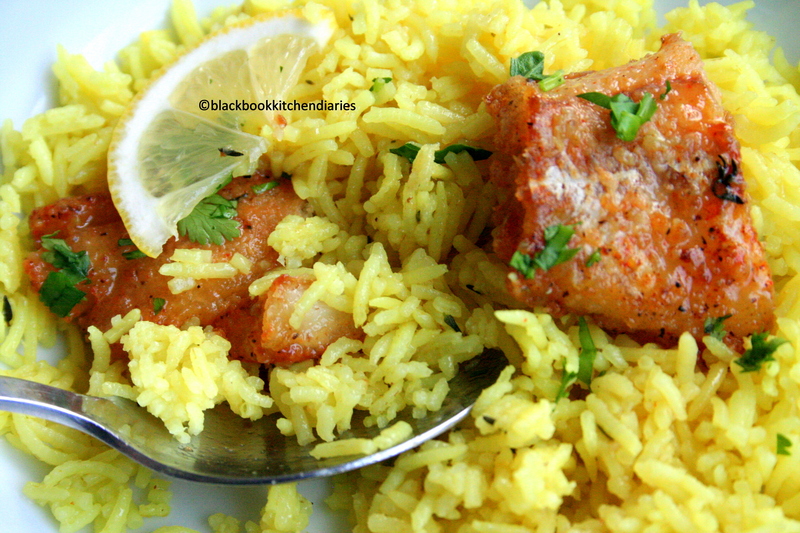 I love fried fish too and it really looks lovely paired with that saffron rice! What a delicious sounding meal. I love rice served with seafood and the lemon and saffron must really make it shine. So happy to have discovered your blog. Wow…I am drooling over here…This looks so delicious…First time here…I am glad that I reached here…and your blog is too good…Straight away bookmarking your blog…This rice dish is really good…Will try it soon…Thanks for the recipe dear…If you have time do check out my blog..
It’s such a pretty meal. Love the color of the fish and rice. This looks absolutely amazing, haven’t had crispy fish in a long while. on September 27, 2011 at 3:15 pm | Reply Platanos, Mangoes and Me! The rice sounds really good. Great combo and a really nice recipe.